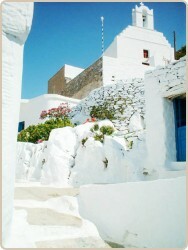 AMORGOS The Island of the big blue. 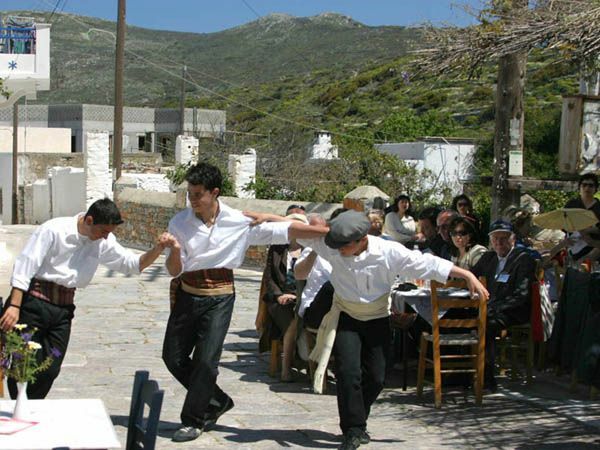 Amorgos is a remarkably unspoiled island at the south-eastern edge of the Cyclades group, where traditional customs are still inextricably interwoven into a landscape as rich in beauty as in its history. Originally inhabited by seafarers from Asia Minor in the 4th Century BC, the island now cradles a people who enjoy a lifestyle that has been shaped by a varied and dramatic past. This is a place that appears untouched by time, but where the inhabitants quietly preserve one of the best kept secrets of the Aegean. ...The length of the island is 33 kms and its width between 1,5 to 6 kms. 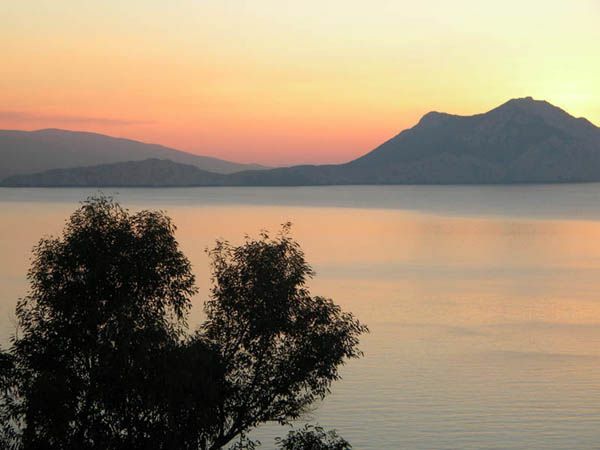 There are three mountain peaks "Krikelos" (822m) to the north, "Profitis Ilias" (699 metres) in the middle and "Korax" (607 metres) to the south-west. The dramatic mountain scenery provides a fine backdrop to some excellent walking. Meadows and areas for cultivation, can be found in the area of Aegiali at the north, in Katapola at the centre, and at Arkesini the southern part of the island. 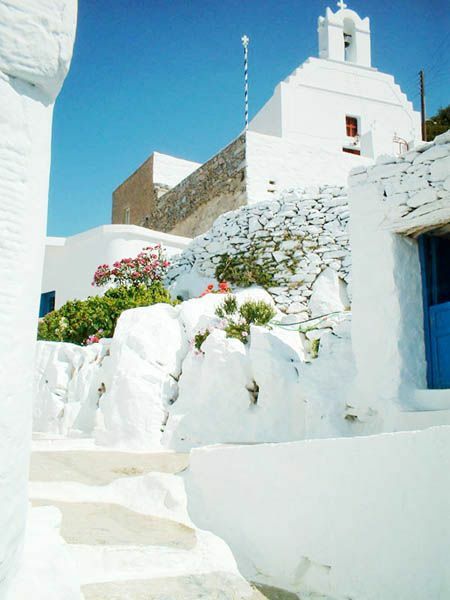 There are two ports on the island: of Katapola, and of Aegiali, where ferries, catamaran and hydrofoils call, connecting Amorgos with the other islands and the main land. ...There are several beaches along the coast line. In Aegiali, the beach is long and sandy, and starts from the edge of the fishing village Ormos. "Levroso", "Psili Ammos" and "Hohlakas" are 15 min. walk from the port, and can also be reached by small boat on a regular schedule. On the nearby small uninhabited island of Nikouria, there are two nice sandy beaches, where small boats cross people for swimming, from the bay of "Agios Pavlos". ...On the other steep side of Amorgos, bellow the Byzantyne Monastery of Virgin Mary Chozoviotissa, the beach of Agia Anna, is famous for the clear blue and turquoise waters. Going south, at the same side of the island, "Mourou " beach is very popular to all for the clear waters, the dark thick sand and the two caves where one can swim in. 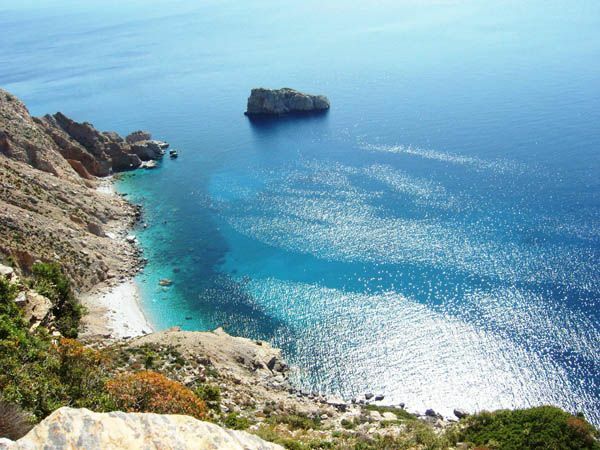 In Arkesini, "Kalotaritissa," "Kato Kambos" and "Paradisia" beaches are some among others found at the South end of Amorgos. 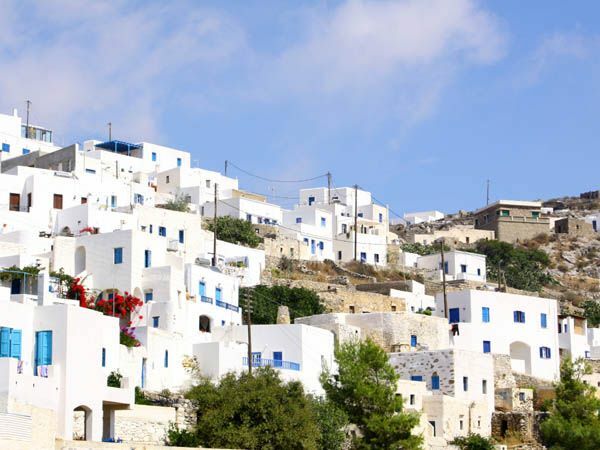 The island has a population of about 1.800 which is found in the port of Katapola, in Chora, the capital, up in the mountains overlooking the east coast, in the port of Aegiali, in the three villages of Lagada, Tholaria and Potamos and in the small villages of South Amorgos: Vroutsi, Arkesini, Kolofana.